A Bank of Ghana report on the collapse of two indigenous banks last year, UT Bank and Capital Bank has revealed that some loans granted by UT Bank were flagged by auditors as flouting prudential regulations. 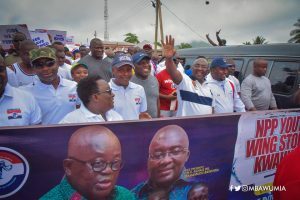 Providing further details of the loans advanced to parties not connected to UT Bank, the report revealed that four subsidiaries of Excel Courier, a company which Alexander Afenyo Markin, Member of Parliament for Efutu in the Central Region, is the main shareholder received an under-collateralised loan of close to ¢31 million from the bank. The commentary on the transaction also said Mr Afenyo-Markin was “a Politically Exposed Person (PEP),” a term that suggests the loan should not have been advanced to the politician. In financial regulation, a person described as a PEP generally presents a higher risk of default by virtue of their position and the influence that they may hold. The value of the collateral Mr Afenyo Markin’s company presented for the ¢30,839, 319.17 was ¢990,000. Furthermore, Mr. Ibrahim Mahama, a businessman and brother of former President John Mahama, borrowed over ¢261 million from the now-defunct bank although Mr. Ibrahim Mahama was also a PEP. Minutes of the Emergency Board of Directors meeting held on 18th March 2016, directed that "a meeting should be scheduled between the Board, Kofi Jobs, (another debtor) and Ibrahim Mahama on March 26, 2016, to discuss their indebtedness to the bank". At the emergency Board of Directors meeting held on 20th May 2016, "the Board expressed great concern about Mr. Ibrahim Mahama's inability to meet his obligations to the Bank. "As at May 2016, his total exposure was approximately ¢302 million and he had made no effort to honour any of the assurances he gave when he met them on March 29, 2016." The Board directed Management to exert more pressure on him to fulfil his obligations and to invite him to meet the Board before the end of 2016. The Board requested a meeting should be arranged between the Board Chairman, Mr. Prince Kofi Amoabeng on one hand, and President Mahama, Mr. Ibrahim Mahama and Mrs. Mona Quartey (then Deputy Finance Minister) on the other to discuss the way forward. Last year, the banking sector shook following news that Capital Bank and UT Bank’s liabilities overwhelmed their assets and the Bank of Ghana (BoG) assumed the responsibility of their assets and revoked their licences. The collapsed banks were “unable to develop an acceptable plan”, according to the BoG, which indicated in a statement that it made efforts to help UT Bank and Capital Bank recover via private alternatives. However, the owners and managers of UT Bank and Capital Bank were unable to increase the capital of the banks to address the insolvency. Purchase and Assumption agreement allowed GCB Bank to take over all deposit liabilities and selected assets of both UT Bank and Capital Bank, per section 123 of the Banks and Specialised Deposit-Taking Institutions (SDIs) Act, 2016 (Act 930).